Unusual lesions and puncture marks found on tyrannosaurid skulls have had a major impact on our understanding of the lives of the tyrannosaurs, as detailed by two recent studies coming out of the US. In a paper published in this month’s Palaios, a team from the Northern Illinois University and the Burpee Museum of Natural History in Rockford have focussed their attention on “Jane,” a 7-metre-long Tyrannosaurus Rex skeleton with a slightly asymmetrical snout and four partially-healed oblong lesions along the left side of its skull. Discovered in 2001 in the Hell Creek Formation, Montana, Jane could be evidence of intraspecific aggression amongst juvenile tyrannosaurs, most likely competing for dominance, territory, or perhaps resources. How the team came to this assumption was by comparing the positioning and orientation of the lesions along Jane’s nasal and maxilla regions to the jaw shape of the only fossil vertebrates found in the Hell Creek Formation that would have been large enough to inflict such wounds – theropods and crocodilians. They found that the size, shape, and spacing of juvenile theropod teeth corresponded convincingly to the positioning of Jane’s lesions, unlike those of a crocodilian jaw (see pic below). 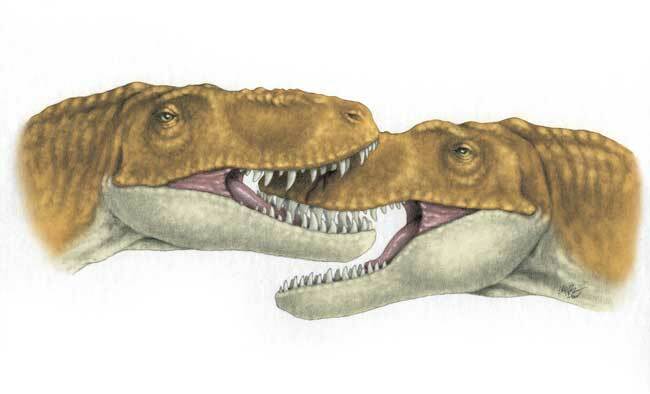 Evidence of face-biting is not uncommon in the tyrannosaurid fossil record, but this is the first indication that this kind of behaviour was not just restricted to fully-matured adults. As Jane’s age has been estimated at 12-years-old, two years prior to the age of sexual maturity for the Tyrannosaurus Rex, the possibility that this was strictly part of courtship-related behaviour has been ruled out. 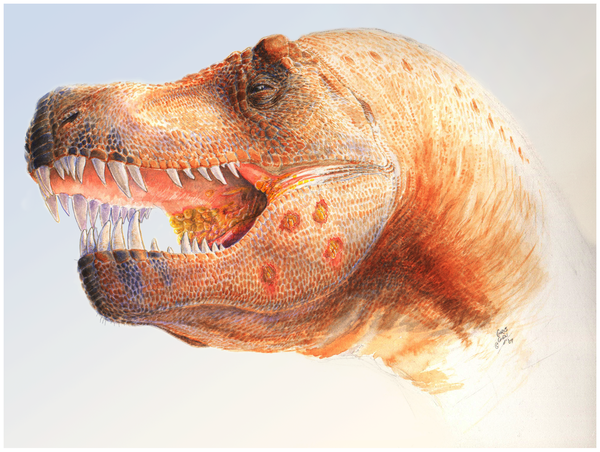 The other kind of face lesions which appear on many tyrannosaurid specimens, including Sue, indicates that the tyrannosaurs faced a far more serious threat than aggressive, face-biting peers. In a recent study published in PLoS One, Ewan Wolff from the University of Wisconsin describes a parasitic infection which causes severe erosion of the jaw bone and ulceration of the mouth and oesophagus, ultimately leading to death by starvation. Of the 61 tyrannosaurid specimens Wolff examined, 15% of them have the tell-tale signs of this infection – several smooth-edged pits in the lower jaw bone – as opposed to the more rough-edged bite marks found in Jane’s skull. However, in many of the specimens examined both kinds of lesions are present, suggesting that the infection could have been transmitted through intraspecific face-biting in much the same way as the cancer currently threatening to drive Tasmanian devils to extinction. What Wolff also found is that the lesions in the jaw bones of these tyrannosaurid specimens are remarkably similar to those found in the beaks of modern birds such as turkeys, chickens and pigeons which have been infected by a protozoan called Trichomonas gallinae. These modern birds can pass trichomonosis on by simply touching each other on the beak, which can lead to a severe ulceration of the upper digestive system and then starvation. This shared affliction is yet further evidence of how closely related birds are to their dinosaur ancestors. “Ha. I’ll show you ugly!” And with that an all-out face-biting brawl errupts, their tails swinging violently into Euhelopus‘ mum’s vases, the Diplodocus’ bottle of Jack, and Euhelopus‘ little brother’s fish tank, sweeping them all onto the floor in a sharp, soggy, and occasionally twitching mess that would likely result in an enormous stained patch of carpet no one could walk on in bare feet for months. PLoS One (open access) // Palaios // Second illustration by Erica Lyn Schmidt.